Located in the heart of Banff National Park, a UNESCO World Heritage Site, the world famous Fairmont Banff Springs stands as landmark in the picturesque alpine town of Banff, Alberta. Canada's "Castle in the Rockies," has been providing legendary hospital ity to our guests for more than 125 years. Fairmont Banff Springs is a year-round luxury mountain resort that offers a championship golf course during the summer and unparalleled skiing in the winter, the Willow Stream Spa and authentic dining. 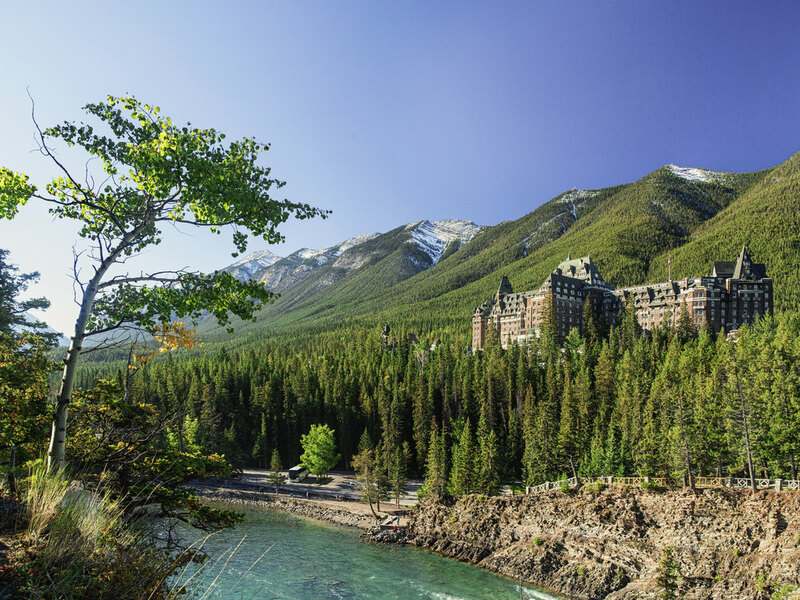 Fairmont Banff Springs is an alpine resort offering world-class amenities year-round. The Stanley Thompson Golf Course and Tunnel Mountain Golf Course, award-winning Willow Stream Spa and authentically local dining experiences. Aquatic Indoor Pool Closure 12 noon on Monday, September 3 to 12 noon on Friday, October 5, 2018. Fairmont Banff Springs offers all the amenities of a world-class resort with superbly appointed guest rooms and attentive personalized service. From rooms tucked away in quiet corners of the castle with amazing views of the Bow Valley to spacious suites with sweeping mountain views, the perfect room awaits you. With views of the celebrated Stanley Thompson fairways, luminous rivers and unforgettable mountains, Stanley's Smokehouse is the ideal venue for that good ol' Southern barbeque. Closed for the Season, Opening in May 2017. Pinkies Up! We are proud to present a menu steeped in tradition and designed to create the most memorable of Fairmont experiences. The Rundle Lounge takes on England's most beloved ritual to new heights with 12 of our finest loose leaf teas. Indulge in the extensive selection of unique and traditional hot and cold brunch favorites in a family friendly atmosphere. Our friendly chefs would be pleased to prepare your fresh made-to-order omelet at our 'open kitchen' omelet station. From tempting appetizers, hand-made pasta and the ultra-thin, ultra-delicious pizzas, Castello Ristorante will have you playing on your passions for rustic Italian food. Come celebrate the simple pleasures of great food, and wine. Are you ready to put the sizzle in your summer? Join the fiesta down at Lookout Patio! Views of the Bow Valley and authentic Mexican fare what's stopping you from joining us for some amazing margaritas and tasty tacos? Closed for the season. A rare experience! Delivering the best of Alberta beef with a menu developed through lasting relationships with local farmers and purveyors. From our delectable menu to our spirited cocktails, everything you see in front of you is made in-house. Nestled in the woods above the Bow and Spray rivers, is our Bavarian cottage-style Waldhaus Restaurant. Feast on a hearty menu of authentic Alpine cuisine, including Schnitzel and Fondue, in an atmosphere reminiscent of an old hunting cottage. Charcuterie so good that you won't want to share. Curated selection of the best house-cured meats, artisan cheeses perfectly paired with our pantry of preserves and the best part of all, the best selection of wine to elevate your charcuterie game. Enjoy an authentic Japanese culinary experience at the Samurai Sushi Bar and Restaurant, featuring beautifully presented melt-in-your-mouth fresh sushi and sashimi, as well as, interactive hot pot dinners such as shabu-shabu and sukiyaki. This relaxed, informal lounge is located in the Stanley Thompson lobby. Old school vibes and new school drinks, Ramsay Lounge will have you sipping you cocktails Aprés ski, hike or Aprés anything you like. Ramsay Lounge is the ultimate place to be! Rundle Lounge is pleasant and bright by day, enchanting and intimate by night. The Lounge offers a spectacular view of the Bow Valley and is a favorite with the cocktail crowd. Lounge menu available. Waldhaus Pub & Patio is the ultimate place to relax and enjoy the mountain scenery all around you; sample from a tempting menu of popular pub fare and Bavarian delights, along with a superb beer selection including authentic Hacker Pschorr beers.